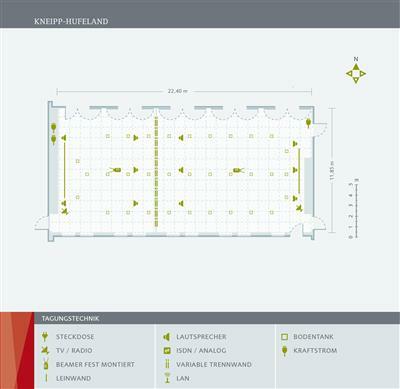 The "Kneipp-Hufeland" Conference Room is located on the 1st floor of the INSPIRA Conference Center of the Steigenberger Hotel Der Sonnenhof in the Allgäu and is the same size as the "Otto-Mach" room on the ground floor of the INSPIRA Conference Center. With a floor area of 265m² the room can be used for all forms of seating. Air conditioning and large windows which can be opened ensure an optimum room climate at all times. Your presentation will be seen to its best advantage on the extra large screen (5x4 meters). Further extras add to the comfort of a stay at one of the most beautiful conference hotels in the alpine uplands: lighting and dimming can be regulated via a user friendly touch screen. In addition, the arched ceiling can be illuminated indirectly in color, for example, in your own company colors. Spacious wall cupboards afford the event manager and trainer sufficient storage space. Chairs and conference tables are designed in a particularly ergonomic form and ensure maximum working comfort even in the case of intensive meetings. 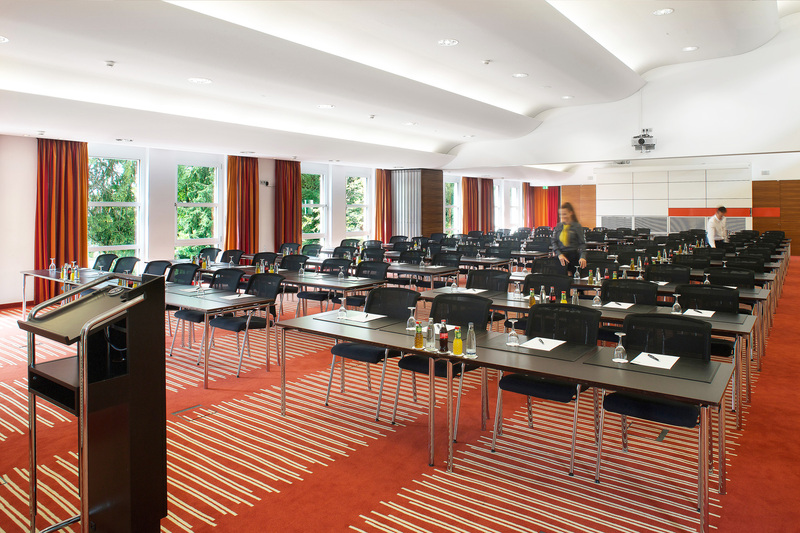 Leather writing surfaces underline the elegant, pleasant atmosphere of the conference hotel in Bavaria. Floor tanks with connections for EDP and electrical power are within reach of every place. And, of course, WLAN is free of charge throughout the whole of the INSPIRA Conference Center. The foyer presents an impressive background and sufficient space for coffee breaks, small group tasks or your accompanying exhibits.